Signed: Case, dial, movement and bracelet signed. 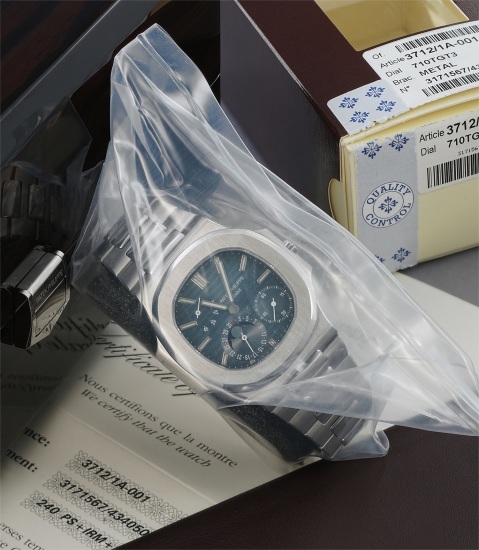 Accessories: Accompanied by Patek Philippe fitted box, Certificate of Origin and factory service box. Patek Philippe introduced reference 3712/1A in 2005, and it remained in production for approximately one year – some estimate as few as eight months. Its successor, the much-coveted reference 5712/1, was launched in October of 2006 to commemorate the 30th anniversary of the Nautilus, alongside the references 5712R (the first Nautilus to be offered on a leather bracelet), 5800/1, 5980/1, and the highly successful 5711/1. Originally designed by world renowned Gerald Genta, the first of the Nautilus family was presented in 1976. Reference 3712/1A was at the time of its launch, the most complicated version of the Nautilus made by Patek Philippe, which had previously only indicated the date. The letters following the official name of the self-winding caliber 240 – PS IRM C LU – stand for "petites secondes" (small seconds), "indication de réserve de marche" (power reserve), "calendrier" (date), and "lune" (moon), all of which are present on the 3712 in an idiosyncratic but somehow harmonious arrangement. At first glance, the 3712 appears quite similar to its successor, the 5712, but there are many noteworthy differences when the watches' details are examined. Most notably, the 3712 has a slightly smaller case measuring 42 mm in diameter as it is constructed using only two pieces compared with the more rounded, three piece, 43mm case of the 5712. The dial of the reference 3712 features wider grooves, or channels, and different hour markers than its successor. A particularly subtle but well-studied detail is the presence of just three red dots on the power reserve indicator, versus four dots on the 5712, to indicate a low remaining power reserve. Appearing for the first time at auction, still sealed in its factory service box, this rare Nautilus is sure to delight any collector of luxury steel sports watches. Case, dial, movement and bracelet signed.